We saw these light up charging cable long back, but they did not surfaced in the market until now. The cable uses animated electroluminescent light flow technology to “visibly present the electrical current flowing through the cable.” Not only that, but the flow is faster when your iPhone, iPad or iPod touch is low on juice. When you reach 70% charging, the light flow slows down, shutting down when the device is fully charged, pushing the charger into automatic power-saving standby mode. Amazing isn’t it! Call it tacky or Call it cool. Call it whatever you want, but this is the awesomest useful charging cable for SmartPhones, Tablets and iPads ever created by homo sapiens. It illuminates with electric blue light (if you order a blue one) and springs to life as soon as you plug it in! 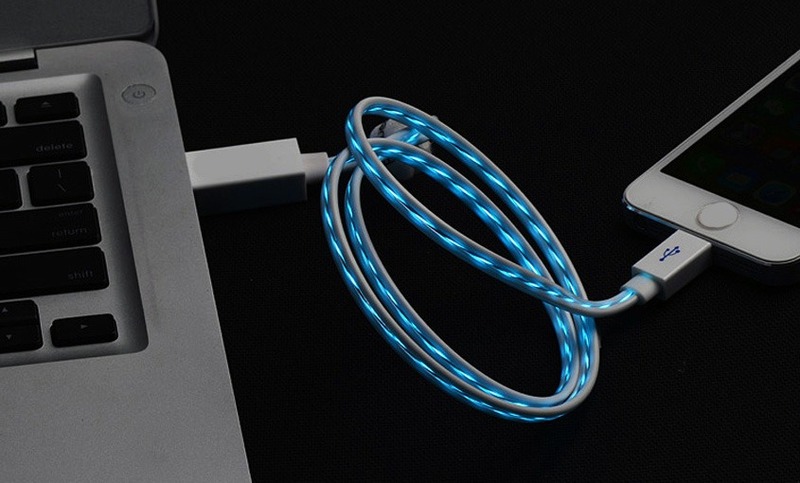 A Visible light up charging cable with lightning connector for iPhone, iPad, and iPod Touch, goes for roughly about $49. A charge and sync cable compatible with most smartphones sporting a micro USB charging port or USB Type-C costs about the same. If you do not want to spend $49 and still own that cable, visit the link below for great deals and discounts. This entry was posted in Awesome Gadgets. Bookmark the permalink.